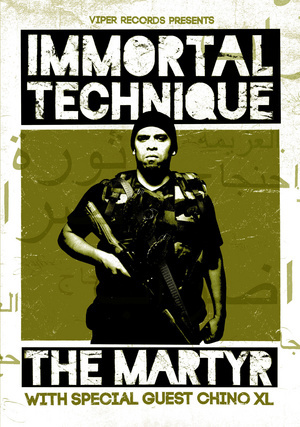 Immortal Technique was kind enough to give me an e-mailed interview to preview his show on Sunday night at the Glass House in Pomona. songs from the new album? A: My set in Pomona will hopefully not be short. I try to give the people at least an hour and a half. In terms of the performance I’ve been doing a mixed set of New material and some of the underground classics that people always ask for. and what it means in these times? A: I would like to see the Occupy movement will eventually evolve into an opposition force against the anti democratic forces that have expanded their control over this country. It is in the fetal stages of that, because the voice of the people is the only real system of checks and balances that is not corrupted as of yet. I have visited several Occupy sites on my tour and I see them directly address some of things the federal government has swept under the rug. I hope the people aren’t discouraged by a few set backs. a response to these times? A: I have of course updated the format we promote it is very web based but being that I still move lots of physical product then I can’t ignore the traditional means. The Free album had more to do with showing people that in these horrific economic circumstances there is no greater expression of solidarity than to give away some of the music I made for free. I mean one dimension commercial artists are asking full retail price for trash. The revolutionary response, give it to them for free. Q: Have you ever performed “You Never Know” from Revolutionary Vol. 2 live? A:. Not really. I can count the number of times I have performed that song with one hand. The first time as a matter of fact was at a hospital for an auditorium full of patients suffering from HIV so it was a surreal and very difficult situation. But I got a standing ovation so I guess I did something right. Besides that though just once at Rocksteady, once at the first show I ever did in LA. And one other time. Like I said… I can count them on one hand. Brother Ali and Killer Mike? Why did you choose these three artists? A. The Civil War song came from an idea I had about internal struggle. After all a civil war is a revolution in a sense an internal revolution that has usually exhausted every other means of petitioning its government. I had been coming to the South for a while so when the rift between East Coast and Southern Hip Hop began I was disgusted. I knew they had lyricists and that payola on NY radio had just worsened the gap because local artist felt they were looked over. I knew that fundamentally the independent street rappers from South and I had more in common with me than the commercial hip hop aristocracy. So I worked with them and we built a strong network, one I look forward to expanding on. Hence my verse about the Southern East Coast reality and how it is perpetuated by an industry that would rather see Black and Latino people as a caricature of themselves than who we really are. The shunning of intelligence and self determination in exchange for stereotypes. That was my internal struggle in Hip Hop. I chose Killer Mike because he had a similar past, heavy in the streets but had a wealth of knowledge. I had gone out to ATL and he treated me like a brother. He has seen people from various factions willing to fight to the death against people that are not their enemy. His verse concerned the inner conflict of people who were conditioned into different cultural backgrounds by colonial powers. Brother Ali I asked to come and round out the entire project by talking about the inner struggle of Islam in America and the hatred and hypocritical criticism. Ali is a professional and one of the best MC’s I’ve had the pleasure of working with. So once I told him the concept for his part he knocked it out of the park. Chuck D is a mentor, a legend, a pioneer and a personal inspiration. Once it was all done I simply asked him to bless the hook and it rounded the song out perfectly. Shout to my brother Southpaw for the track! Q: Date & title of next release? Much respect sorry for any grammar. And I appreciate you giving me a chance to speak.